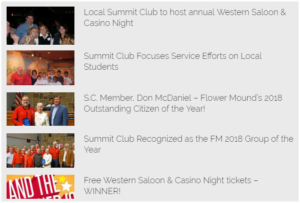 See the full details on Western Saloon & Casino Night here. Each Ticket Includes: (1) door raffle ticket, $1,000 in chips and an event program. iced tea, great deserts, live music and a promise of lots of fun!!! * Online ticket sales have ended. You may purchase tickets at the door for $80.00 per ticket.